It feels so weird writing this post. I literally have 20 weeks left. More than likely I might be induced before my due date because of Obstetric Cholestasis if it gets bad again, but my god, I am so excited. It feels a little different this time. I am not worried about not being able to share the love like I did when I was pregnant the second time, with Elliw. But this time it feels so different because I will be giving birth to a baby boy. I have noticed I am carrying differently this time round than I did with the girls. I am more out, as with the girls I was more round and all over. This pregnancy hasn't been very enjoyable with the pains and worries but I can't stop thinking that in just a few months time, we will have a baby boy in the house, my son. My first ever son. It just feels like a dream, doesn't seem real at all. I have always wanted a baby boy, I am not quite sure why I have but now it's actually happening and I can not wait. I haven't got everything ready yet, but hopefully everything will be ready and sorted by the end of June, that is my plan. The girls are really interested in how big baby is every week and how bump is growing each week. Mia has called me 'fat', but it's funny when she says it. Mia does things a bit more secretly and quieter than Elliw. Mia will come to hug me and put her head on bump to try and listen to baby moving. She asks a few questions whilst she does it too. Elliw on the other hand will come running to me and give baby/bump a hug. But she can sometimes go over hyper and that's when I need to tell her she has to calm down, just in case. I am so glad I told the girls when I did because it's learning them to bond with their little brother and he's not even here yet. It's getting me more excited for them to meet him when he finally arrives. This is going to be our last baby, I don't want anymore and neither does my partner. When he arrives, our family will be complete. 3 children and 2 adults, the idea scares me but really gets me excited. There is only 2 years and 3 months between Mia and Elliw but there will be 4 years and 4 months between baby and Elliw and 6 years 6 months between him and Mia. It does scare me a little that I will have to try and learn to get used to looking after a newborn again, after a long time but I am up for it can't wait. I am really looking forward to seeing him go through all the milestones such as crawling, sitting, walking, talking and so on. Wow! Getting closer now. I found that the second half went so much faster. Good luck! So lovely to read about the love that surrounds this baby boy already! Enjoy the rest of this pregnancy! I'm so jealous! We aren't having another baby for atleast 3 years from now when my little boy will be nearly 6. We just cant cope at the minute. I hope the rest of your pregnany goes smoothly and enjoy them newborn cuddles! 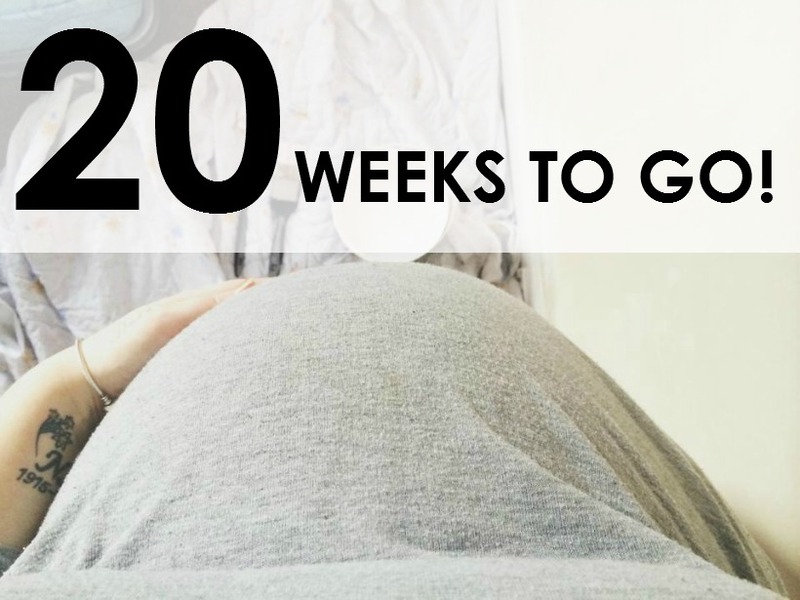 20 weeks already - that has flown by! The next 20 weeks will too, and then baby will be here. So exciting! Exciting! The next 20 weeks (or so) will fly by for you and then you will have your baby boy in your arms. Hope the rest of the pregnancy goes smoothly for you.